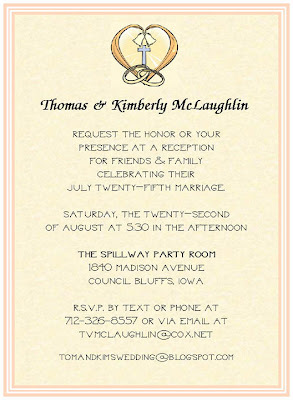 Kimberly Kaye Muta, daughter of Philip Muta and Mary Schabacker & Thomas V. McLaughlin Jr., son of Thomas V. McLaughlin Sr. and Linda McLaughlin will entered into marriage on the 25th day of July in the year of our Lord 2009 at Holy Name Catholic Church at 2:00 PM. After an eleven year courtship and a seven year engagement, it's finally official. Thanks to all who have been so supportive. This is a Flickr badge showing items in a set called Family Photos. Make your own badge here. We'd love to have you sign our guest book and offer us words of advice. To sign our guest book, go to the bottom of this post. Click on the link that reads "comment." A comment box will pop up on your computer screen and then you're ready to sign. In order to avoid spamming, we have a verification window. The tuxedos are dry-cleaned, thank you notes in the mail, and the formal portion of our marriage is done. It was a wonderful ceremony that we shared with members of our family. And then we did all the "formal" things at the dinner we held for the members of our family. Happily married for three weeks now, we're ready to have a relaxing time with friends and cohorts. So, we're going informal. Our reception is being held in the party room at The Spillway which was formerly Mosquito Creek Saloon. It is a spot where many LC folks enjoy having a great meal and relaxing with friends. Need directions to The Spillway? You'll find them by CLICKING HERE. We hope you can join us for a little while or maybe you can pull up a chair and enjoy some great fellowship with some great folks. 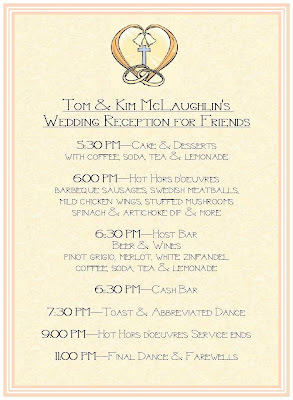 We've decided to provide friends and colleagues an opportunity to visit with us for the first hour of our reception with cake, coffee, iced-tea, lemonade, soda and some delicious desserts. At 6:00 we will be providing these guests hot hors d'oevoures. We will be providing music and a toast during this period as well. After 6:30, we will be saying goodbye to all individuals who are under the age of 21. At that time, we will be opening the host and cash bars. The hot hors d'evoures will be served until 9:00 pm. Hopefully some brave souls will hit the dance floor. If not, we can certainly enjoy each other's company for the remainder of the evening. We had the opportunity to preview the almost 400 photos that were taken during our rehearsal, the ceremony and the dinner, dance and reception that we held for members of our family. 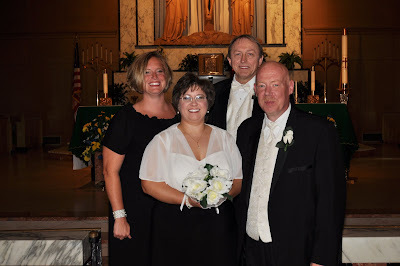 The photo above features Matron of Honor Laura Flahive and Best Man V. Thomas Heckman with the McLaughlins. Although we deleted several of the photos we previewed, there were so many great shots of our parents, our siblings, nieces and nephews, aunts, cousins and wedding party that we kept several hundred. So, be cautious when visiting our house. We look forward to sharing these with you as soon as they are available. We'll be sending all of our family members a DVD of the photos. We have one that we've chosen as our "official favorites" and another containing most of the other shots. Thanks for checking back. 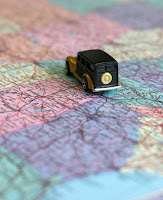 We'll send our FLCKR link to you once we have the photos posted. left top--Paul & Betty Muta, grandparents; left center--Earl & Zella Force, grandparents; left lower--Anne & John McLaughlin, grandparents; under text--Charles & Anna Danielsen, great grandparents; under that to the left, Rosencrantz & Guildenstern, cats; under that to the right, Randy & Matthew Schabacker, step father and brother; upper right, Kathryn Hoggatt, grandparent; center right, Luis Hoggatt, grandparent; lower right, Anne McLaughlin, grandparent. Welcome to our wedding website! We are thrilled to share this wonderful occasion with all of you. Our non-traditional approach to this union is important to us. We are inviting family only to the ceremony. We will celebrate our marriage with friends later this fall. We hope you appreciate our approach as much as we do. We love all of you dearly and we are thankful that you are taking the time to join us on this important day. We are so very thankful for our families. You are the core of who we are. More than that, we are honored to have you join us as we begin our marriage in the eyes of God at 2:00 pm on July 25, 2009. Our wedding will be held in our parish, Holy Name Church in Omaha, Nebraska. We look forward to sharing this beautiful day with you. Our rehearsal will be held at Holy Name at 6:00 pm on Friday, July 24, 2009 at 6:00 pm. Thank you in advance for all that you bring to our lives. Directions to Holy Name Catholic Church. Father, you have made the bond of marriage a holy mystery, a symbol of Christ's love for his Church. Hear our prayers for Kimberly and Thomas. With faith in you and in each other they pledge their love today. May their lives always bear witness to the reality of that love. We ask you this through our Lord Jesus Christ, your Son, who lives and reigns with you and the Holy Spirit, one God, forever and ever. "Sister, get up. Let us pray and beg our Lord to have mercy on us and to grant us deliverance." "Blessed are you, O god of our fathers; praised be your name forever and ever. Let the heavens and all your creation praise you forever. You made Adam and you gave him his wife Eve to be his help and support; and from these two the human race descended. You said, 'It is not good for the man to be alone; let us make him a partner like himself.' Now, Lord, you know that I take this wife of mine not because of lust, but for a noble purpose. Call down your mercy on me and on her, and allow us to live together to a happy old age." They said together, "Amen, amen." I urge you, brothers and sisters, by the mercies of God, to offer your bodies as a living sacrifice, holy and pleasing to God, your spiritual worship. Do not conform yourselves to this age but be transformed by the renewal of your mind, that you may discern what is the will of God, whi is good and pleasing and perfect. Let love be sincere; hate what is evil, hold on to what is good; love one another with mutual affection; anticipate one another in showing honor. Do not grow slack in zeal, be fervent in spirit, serve the Lord. Rejoice in hope, endure in affliction, persevere in prayer. Contribute to the needs of the holy ones, exercise hospitality. Bless those who persecute you, bless and do not curse them. Rejoice with those who rejoice, weep with those who weep. Have the same regard for one another; do not be haughty but associate with the lowly; do not be wise in your own estimation. Do not repay anyone evil for evil; be concerned for what is noble in the sight of all. If possible, on your part, live at peace with all. Taste and see how good the Lord is; blessed the man who takes refuge in him. Gospel Acclamation: (John 4:8b, 11) God is love. If God loved us, we also must love one another. Jesus said to his disciples: "As the Father loves me, so I love you. Remain in my love. If you keep my commandments, you will remain in my love, just as I have kept my Father's commandments and remain in his love. I have told you this so that my joy might be in you and your joy might be complete. This is my commandment: love one another as I love you. Lord, bless these rings which we bless + in your name. Grant that those who wear them may always have a deep faith in each other. May they do your will and always life together in peach, good will, and love. We ask this through Christ our Lord. 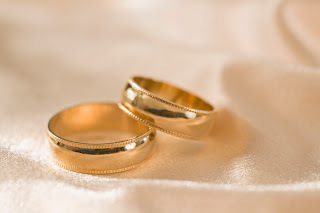 The priest invites the couple to declare their consent: Since it it you intention to enter into marriage, join your right hands, and declare your consent before God and his Church. I, Tom, take you, Kim, to be my wife. I promise to be true to you in good times and in bad, in sickness and in health. I will love you and honor you all the days of my life. I, Kim, take you, Tom, to be my husband. I promise to be true to you in good times and in bad, in sickness and in health. I will love you and honor you all the days of my life. Tom, do you take Kim to be your wife? Do you promise to be true to her in good times and in bad, in sickness and in health, to love her and honor her all the days of your life. Kim, do you take Tom to be your husband? Do you promise to be true to him in good times and in bad, in sickness and in health, to love him and honor him all the days of your life. Tom & Kim will present an offering to Mary during the lighting of the unity candle. To be offered by Traci McLaughlin, sister to Tom and Kim. For our pope Benedict, our bishop George, and all who minister to the Church, that they may lead all of us to love one another as the Father loves us. For the leaders of our country and all political leaders, that they continue to promote true justice and peace for all. For the sick, lonely and the poor people of the world, that through our prayers of love and concern they will be blessed. For all who have chosen marriage as their vocation, that their love for one another fosters growth and deepens the faith of all whom they meet. For our relatives and friends gathered here, that they always share the faith, hope and love they have with their families. For Tom and Kim who have been married here today, that their lives may be blessed with love and graced with lasting peace and health. 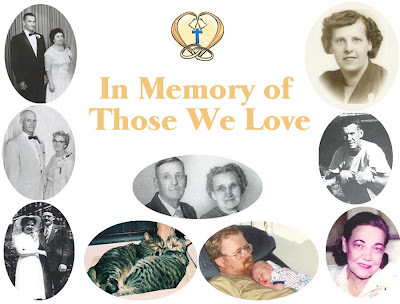 For all who have died, may they be experiencing eternal joy with the everlasting God of love. The gifts will be presented by the parents of Kim--Phillip Muta & Mary Schabacker--and of Tom--Tom McLaughlin & Linda McLaughlin. The holy body and precious blood will be given in communion. Mike Muta, brother to Tom and Kim will serve as an eucharistic minister with Fr. Baumert and Fr. McLaughlin. Father, all-powerful and ever-living God, we do well always and everwhere to give you thanks. You created man in love to share your divine life. We see his high destiny in the love of husband and wife, which bears the imprint of your own divine love of husband and wife, which bears the imprint of your own divine love. Love is man's origin, love is his constant calling, love is his fulfillment in heaven. The love of man's origin, love is his constant calling, love is his fulfillment in heavan. Holy Father, you created mankind in your own image and made man and woman to be joined as husband and wife in union of body of heart and so fulfill their mission in the world. Father, to reveal the plan of your love, you made the union of husband and wife an image of covenant between you and your people.